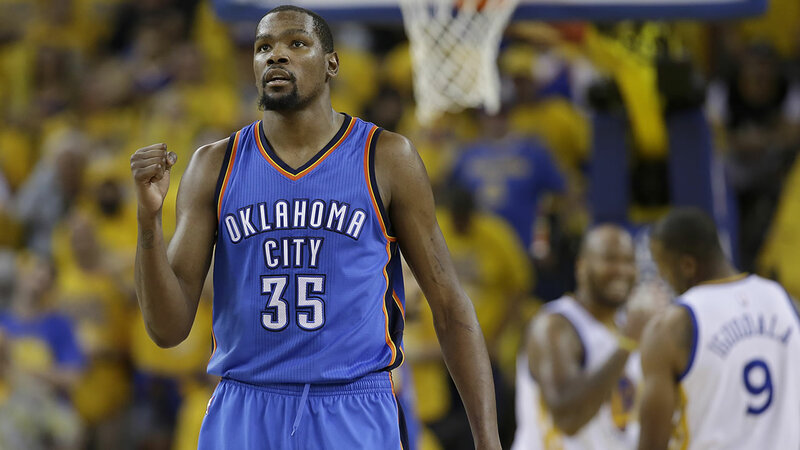 THE HAMPTONS, N.Y. (KGO) -- The made their pitch to free agent Kevin Durant on Friday in the Hamptons. And Golden State sent quite a contingent to the Oklahoma City Thunder star. Along with Coach Steve Kerr, owner Joe Lacob, and GM Bob Myers, the Warriors had Steph Curry, Klay Thompson, Draymond Green, and Andre Iguodala in the meeting that reportedly went for three hours. Durant also has meetings with a handful of other teams today and tomorrow and is expected to make a fairly quick decision. The expectation is that he will stay with his current team in oklahoma city, which can offer him the most money. After the meeting, Iguodala sent out a couple of cryptic tweets that had Twitter abuzz but shed no light on what's happening. The fam def got blessed today!!! Unless you know what "nah b" means or "the fam def got blessed today." Ponder that while we wait for Durant's decision.